It’s a great thought, but can it work? A new study from North Carolina State University shows that a near infrared test for particle-size in feed is within our grasp. A particle size test that is about 30 times faster than current methods, yes please! Most feed laboratory managers do not need to think long and hard about whether they would like a more convenient test for particle size in animal feed. In pursuit of this goal, Dr. Adam Fahrenholz at North Carolina State University has teamed up with analytical solution providers FOSS to look at how near infrared (NIR) instruments could take on the job. A quick review of the current analysis method reveals why a faster analysis would be so welcome. Involving equipment such as sieves and sieve-shakers, the particle size test typically takes 15 minutes, plus five to ten minutes of preparation time and analysis time, not including the recording of time and date information. A single test can take a well-trained operator anywhere from 20 to 30 min depending on what they are testing for. At the same time, particle size is so important to the feed mill that multiple analysis may be required per day when setting up equipment, and often once per shift, or several times a week under normal operations. Particle size is also important for the physical flow of the feed, especially for meal feeds. For instance, if the particle size is overly fine it can lead to problems in flow through feeders and out of bins. 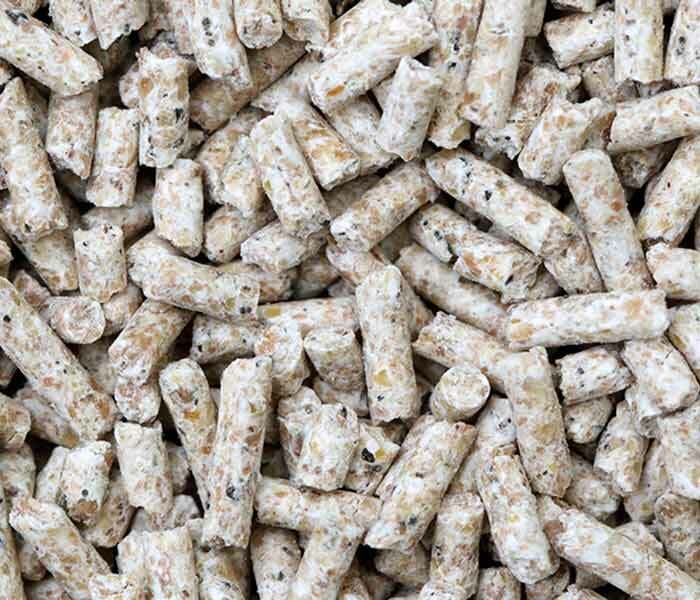 And perhaps most importantly, on the nutrition side, particle size affects feed conversion for both pigs and chickens either in terms of intake or digestion or both. For poultry, some coarse particles in the diet are necessary for gizzard health “At the end of the day it all comes down to what gives us the most efficient pounds of feed per pound of gain of that species,” concludes Fahrenholz. Yet another factor for feed millers to consider is the variability of raw material, for instance when a mill switches over from so-called old crop corn harvested the previous year to the new crop corn that will grind differently. The bigger the operation, the bigger the potential impact of variations in particle size becomes. Some manufacturing facilities are turning out huge amounts of feed, perhaps around 20 to 25,000 tons of feed per week. Running 24/7, the mill is getting more mileage than a yellow cab and wear parts such as screens and hammers need replacement every few weeks. Given that many feed mills today already have NIR analysis equipment in place it would make perfect sense to use it as a rapid method – no sieving, no manual recording, just put the sample in the sample cup and push the start button. To investigate the possibility, Fahrenholz embarked on a calibration project aimed at getting enough data on particle size variation to program an NIR analyser. Firstly, he teamed up with NIR product specialist Ole Rasmussen from FOSS and then Fahrenholz and his graduate student J.T. Pope began to do reference tests and collected data on particle size, including average particle size (DGW) and standard deviation by weight (SGW). The SGW represents the distribution, and the larger the SGW the more varied the sample. Average particle size is the particle size at which 50g of a 100g sample are larger and 50g are smaller. Geometric standard deviation by weight (SGW) is the distribution of particles in the sample - the larger SGW the more varied the sample. Equipment: Stack of Sieves including pan and cover, Balance (with accuracy to 0.01 g), Mechanical sieve shaker. Many steps involving sieving, mass sample calculation, cleaning of sieves, weighing of separate sieves, calculation of result. Typical analysis time: 30 minutes. Equipment: An NIR instrument already in use for other purposes. Method: A sample is poured into a sample cup and the operator pushes the start button. The result is delivered simultaneously with other results for protein, fat, moisture and so on. Analysis time: less than a minute.